Some car components really do keep a low profile. You’d only notice how they function if they weren’t there. 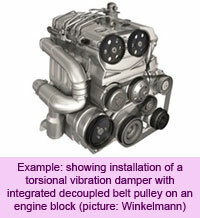 Vibration dampers are a good example, reducing unwanted vibrations produced by engines and drivetrains. High-quality vibration dampers are not just made of steel but also oils, thermosetting plastics and elastomers with enhancing damping qualities. 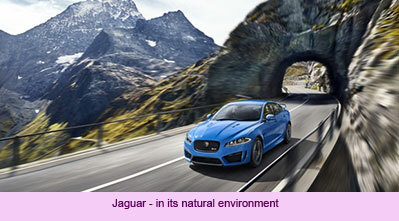 Winkelmann Automotive in Ahlen in Westphalia, Germany, a development partner and system specialist when it comes to vibration dampers, says it developed a vibration damper with two elastomer components for the drivetrain of Jaguar cars. 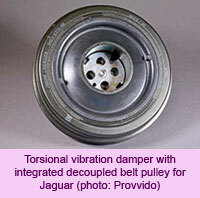 The torsional vibration damper comes with an integrated, decoupled belt pulley. This assembly, comprising 10 metal parts, is supplemented with a pressed EPDM rubber ring and a hybrid, bonded EPDM-Metal part. The assembly weighs a total of 2.99 kg. The elastomer components weigh 180 g.
Vibration dampers with rubber-metal composite parts mean less limitations on geometries and are suitable for high-frequency and complex vibration loads which have to be dampened both radially and axially. 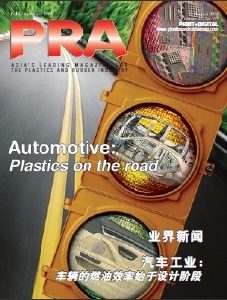 The EPDM rubber ring completes the whole part and is responsible for further positive characteristics of the finished component. 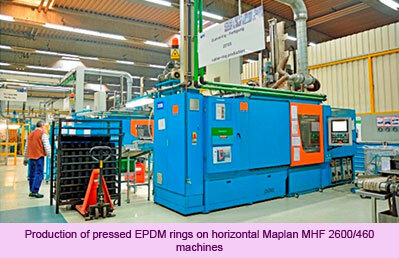 Horizontal machines from Austrian firm Maplan are deployed for the EPDM ring manufacture, which are vulcanised to tight tolerances in a fully automatic process on the horizontal MHF 2600/460 machine using multi-cavity moulds by tooling specialist Peta Formenbau. Precise wall thicknesses are essential to ensure true running pulleys, and are automated inline and continuously checked offline by means of reference samples. EPDM material combines an excellent performance band-width with reasonable costs. Winkelmann says it has also focused on increasing production output. The trick here has been to vulcanise the rings in double width and then radially cut them inline, creating two rings which are then transported to the tempering oven for further treatment. 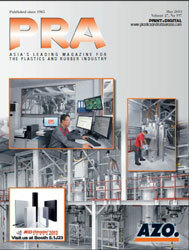 The cutter for this process is from KAMtec. The horizontal Maplan MHF 2600/460 machines possess full-size heating platens to maintain temperatures of both halves of the mould. The fully insulated heating plates are also insulated on the sides, to direct the maximum heat energy to the moulds and minimise losses. This enables precise heating of the cavities and is also used for the cold runner heating plate. CoolDrive II drive technology is applied for the main drive and parallel drive. The DCI heating technology deployed works with controlled pumps where the heating and cooling requirements are accurately adjusted to meet process needs by means of an integrated control algorithm. Typical massive overshooting when heating and undershooting when cooling, a phenomenon that regularly occurs in practice can therefore be effectively prevented. 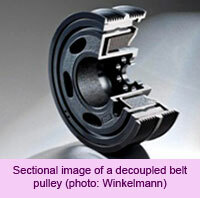 In addition, rubber-metal composite parts for decoupled belt pulleys are manufactured as bonded vibration dampers. These are produced on a vertical MTF 2600/280 ergonomic machine from Maplan with “Fast Double Shuttle“ technology and moulds from Peta Formenbau. Vulcanised bonded vibration dampers mean unrestricted geometries for the elastomer components and are particularly suitable for high and complex frequency vibration loads. 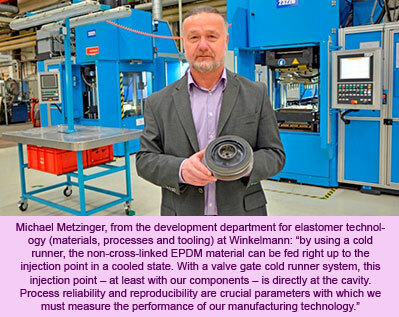 Michael Metzinger: “In order to manufacture these hybrid components, the sheet metal parts are coated with a bonding agent before being inserted into the mould which is then injected with elastomer material“. The quad-cavity moulds from Peta Formenbau have 8 valve gate nozzle cold runners – four cavities each with two injection points per moulded part. In the final expansion phase of the manufacturing plant, six vertical Maplan elastomer machines are deployed at Winkelmann in Ahlen. By means of control of the flow rate, energy consumption of the DCI heating and cooling units on the Maplan MTF 2600/280 machines has been reduced by up to 80% while at the same time considerably improving quality control, says Winkelmann. The CoolDrive servo-hydraulic technology provides additional performance for rapid drying cycle times with less energy requirements. The servo-hydraulic system, in this case additionally fitted with a parallel drive unit for faster cycle times reduce energy consumption for the drive by up to 50% with the same reduction in drying cycle times. Noise emissions have also been halved (-10dB). For the manufacture of rubber-metal hybrid parts with inserts, each production cell is equipped with a “Fast Double Shuttle“. The shuttle features twin guides to fit the shuttle plate. The same twin guides can also be found on the knock-out bars on the clamp side hydraulic ejector. A special feature of this solution is that two identical shuttle plates alternate between the machine and the external station. The advantage of the "Fast Double Shuttles" is that both shuttle plates can be moved at the same time, i.e. while plate A is being removed from the machine, plate B can be placed in the machine. 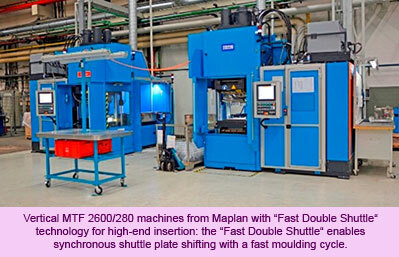 This together with a newly developed, fast servo drive concept means a considerable reduction in loading times, compared to conventional shuttle plate shifting. Furthermore, it has a hydraulically actuated ejector including a dock able heating plate. The external heating plate prevents the shuttle plate when outside the machine from cooling down. The finished rubber-metal parts are ejected from the shuttle plate so that they can be easily removed by the operator.